If you follow me on Instagram @patricia_donascimento or on my Facebook page, you already know that I spent my last weekend in Zurich. It was all about relaxing at the Renaissance Hotel and discovering some interesting places in this city that I love so much. The weather was very cold but with a beautiful sunshine. Regarding the outfit, I chose neutral colors as the beige and the black with high heels and sunnies. Hope you like it and wish you all an excellent day! LIPSTICK : "Honey Love" by M.A.C. This outfit is so chic. I'm in love with camel coat. I like this look so much. Very sophisticated look , love it ! Amazing top and coat!!! So chic and stylish! oh wauw! always looking stunning! especially in love with the chanel pumps!!! You are always so gorgeous!!! Love the shoes!! Very sophisticated and Chic. Great outfit! Chic! Class! Sophistication.you look amazing all the time. oh so high fashion. You look gorgeous! I love the color combination, and those heels!!!! Amazing. Estás espectacular!! Unas fotos preciosas!! Hello dear Patricia!, I'm very busy, so excuse me if I don't visit you many times as I'd like.. Your look is perfect!.. amazing!.. It's a great outfit!.. These shoes OMG, cute!. Hey Patricia! You're really amazing!!! I love the leather top. You look gorgeous and so chic! amazing pictures! they look lika fashion editorial! wow, you have such a great blog and such an amazing style! Wow! Nao conhecia o blog e adorei! Lindo o look e as fotos. Love this outfit!! You are so beautiful!! Such a cool clutch!Happy Wednesday! I repeat myself but u are always perfect! so cool you got to spend time in zurich! you look beautiful!love your style!always looking so chic! This outfit is beyond stunning! You have great style. If you get a sec, please check out my latest post 'Colorblock Party.' I would love to read your feedback. I absolutely love that top paired with soft pieces! Great neutral chic look! That top is fabulous and I love the coat! You look stunning. So beautiful! I love the cut of the coat. Gorgeous look! 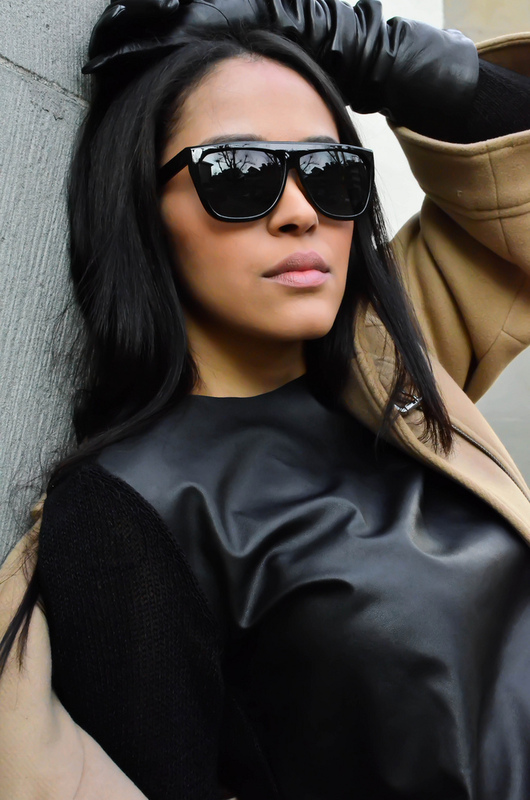 Those sunglasses are awesome, and the black leather with the camel coat is so chic! Love. Absolutely love the leather gloves! Hi, dear!!! Nice look, and I love your coat!!!! I really love how sophisticated you look and your style is amaing ..adn photos..perfect!! Just found your blog - and I love it! I'm already following you via GFC and Bloglovin, right now also via FC. oh my god! It`s grate! Pakistani Escorts know about all these Karachi escorts administrations and will in general stay with the well known ones.